"Icelandic Sheep - Colourful All-Rounders"Sept 2017: - See details in previous blog. I have managed to obtain a few copies of Caroline's book! It never appeared on Amazon UK's website, and, as far as I'm aware, is not available anywhere else in the UK. Price is £12.50, which includes 1st Class signed for postage. Contact me via my "Contact" page to order a copy and for payment options (paypal not available). New book about Icelandic Sheep! !Published (Sept 2015) in English by Caroline Kerstin Mende. 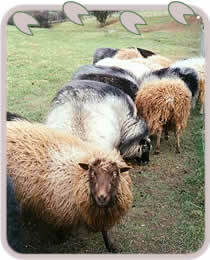 "Icelandic Sheep - Colourful All-Rounders" Available directly from Caroline. I have added a pdf to the "Articles" page of my website giving details about the book and its content. The book contains a lot of information about Icelandic sheep and their fleece. I maintain a balance of earth colours within the flock of icelandic sheep, with few white sheep, as I prefer to spin and crochet natural colours, rather than dye the wool. However I can never be certain what colour lambs nature will produce from any particular mating! It makes lambing time very exciting. Icelandic sheep have an unusual double-coated fleece that I love to turn into lopi wool. There is nothing nicer than watching my icelandic sheep of many colours browsing in the fields against a backdrop of Welsh hills and valleys. Seeing their coats glint and glow in the sunlight is sheer magic. "Cae’rddraig" is Welsh for "Field of the Dragon”, (It is pronounced K-EYE-ER-TH-R-EYE-G) and complements my little lion / dragon dogs (Shih Tzus). 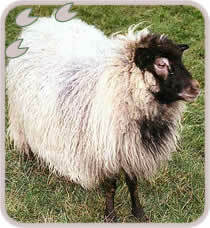 I started breeding Icelandic Sheep in April 1986. My Flock lives 1000 ft up in the hilly uplands of North Wales. The sheep remain outdoors all year round, taking the harsh winter weather in their stride. In the summer they use the shade of the trees and hedging as protection from the hot summer sun. They are intelligent companions, as well as real characters. I have both horned and polled (non-horned) ewes, but only horned rams at present.